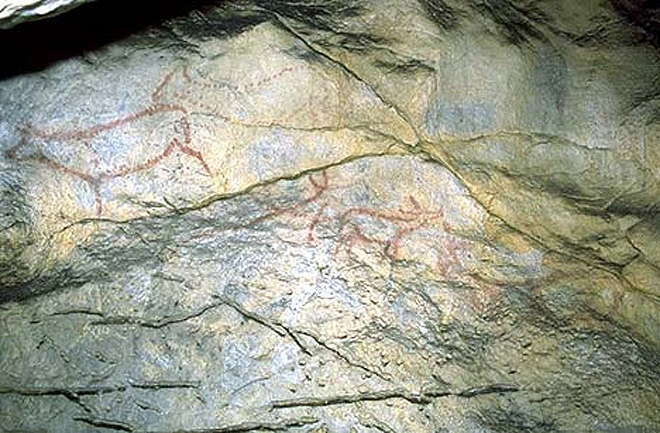 Covalanas cave in Cantabria, Spain, was first discovered to have art work in 1903, though the cave was well known to the locals. 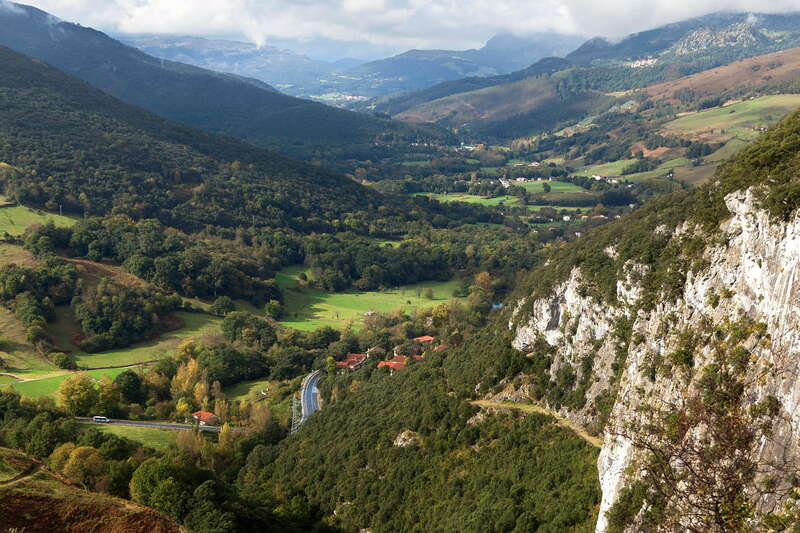 It is situated on the South-Western hillside of Pando mountain, very close to the village of Ramales de la Victoria, and only 40 metres from the cave of el Míron. Although the entrance is not huge, access is easy. From the entrance two galleries continue, though only one of them has palaeolithic decoration. 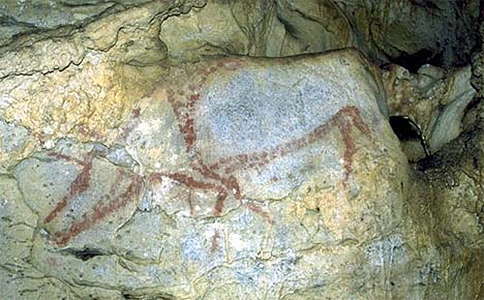 In a deep zone of the gallery, and in a space less than 12 metres in length, the largest group of art in the cave is located. 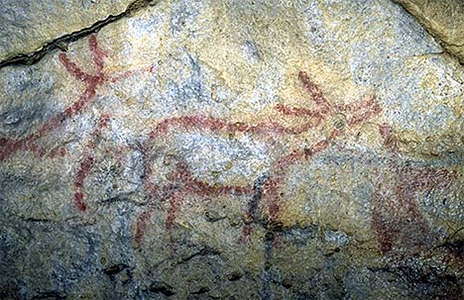 It has 22 figures, of which 18 are hinds , a characteristic animal in the Cantabrian decorated caves, one horse , one reindeer (scarcely represented in the region of Cantabria), one aurochs and one animal difficult to identify. There are some signs, also. 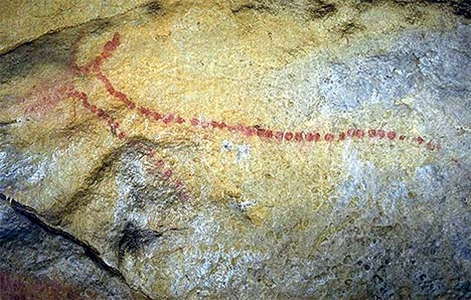 There are some black traces scattered all over the cave and some indecipherable remains of red paintings can be seen in the area at the far end. 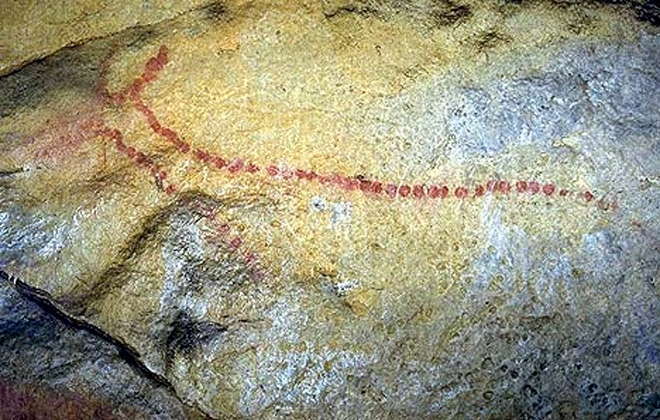 All the representations, except for the black marks, were made with red paint, some of the figures including engraved lines. The technique employed for the representation of the figures is the inkpad, which consists of the construction of lines by juxtaposition of dots. This type of technique appears in few places and always in a red colour in Arenaza cave (Galdames, Vizcaya), La Haza cave (Ramales), La Pasiga cave (Puente Viesgo) and Pondra (Ramales). 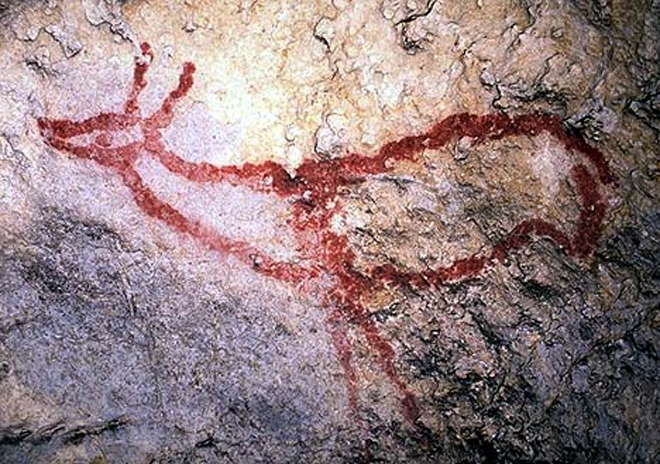 Given the limited use of this technique, some authors have thought of a possible 'Escuela de Ramales' (School of Ramales), establishing chronologically this kind of painting between 20 000 and 14 400 years. This is the mountain where Cueva Covalanas and Cueva de El Mirón is situated. The El Mirón entrance can be seen at the centre of the picture, above a yellowish tree. 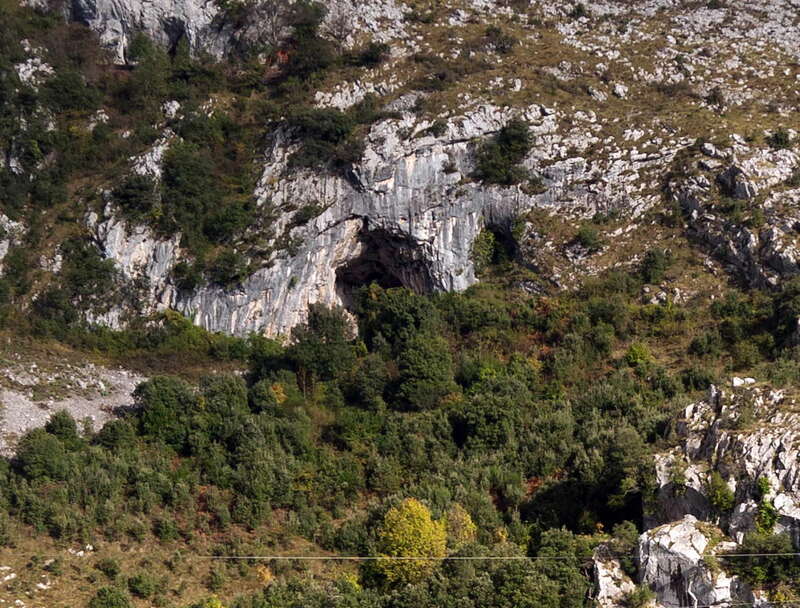 The entrance to Cueva Covalanas is 40 metres away, but hidden in this photo. A close up of the entrance to El Mirón, in the centre of the image. Just above El Mirón is Covalanas Cave, which has beautiful and incredibly well preserved rock art, but the entrance cannot be seen in this photo. View from the Mirón entrance, looking down the valley of the river Asón. This spectacular view (Mirón means 'the watcher') would have been invaluable to the early hunters when looking for game. The valley ends in Santoña Bay and Monte Buciero. Horse and deer at Covalanas. 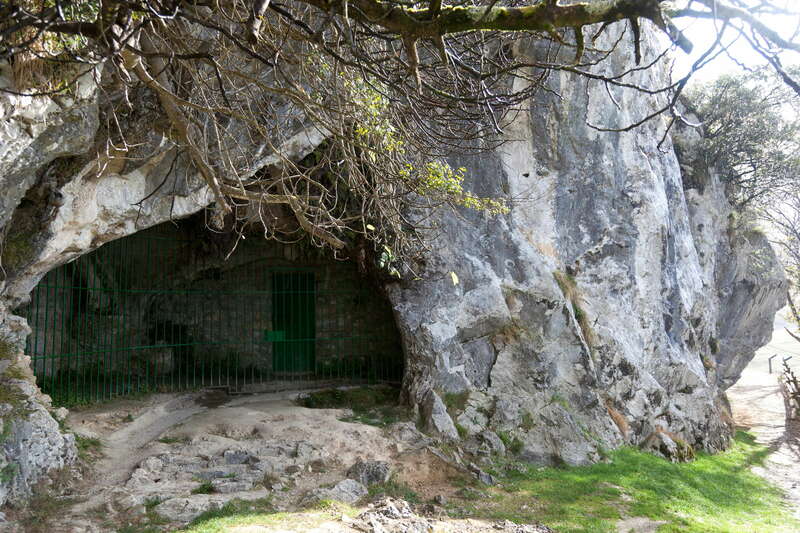 Covalanas cave was known since ancient times as "la cueva de las herramientas" (Tools Cave) by the inhabitants of the area. But it was not until September 1903, when Hermilio Alcalde del Rio, Director of the school of Arts of Torrelavega and Lorenzo Sierra, discovered the paintings inside. 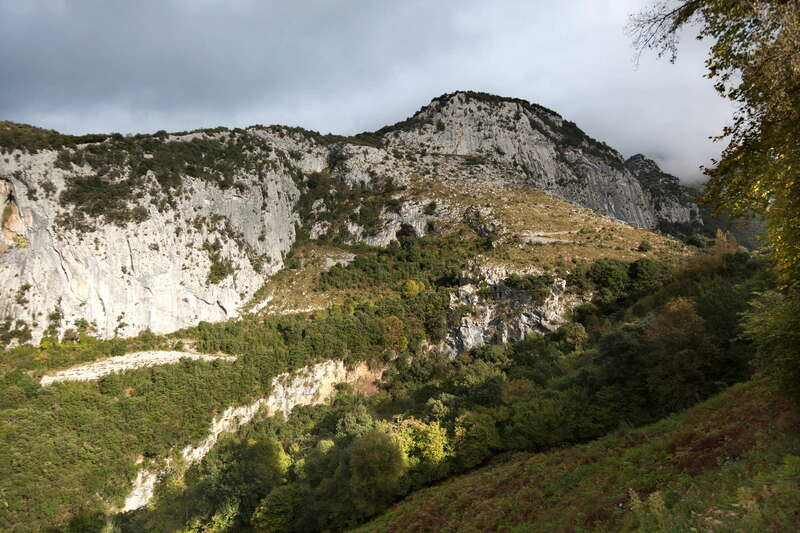 In the decade of the 80s, a team from the Area of Prehistory of the Historic Science Department of the University of Cantabria lead by Dr. Manuel R.González Morales, Dr. César González Sainz and Dr Alfonso Moure Romanillo, made a new study of the cave. Covalanas is located on the South-Western hillside of Pando mountain, very close to the village of Ramales de la Victoria. The entrance does not have large dimensions and access is very easy. From here two galleries continue, though only one of them presents palaeolithic decoration. In a deep zone of the gallery, and in a space less than 12 metres in length, the largest group of representations in the cave is located. It has 22 figures, of which 18 are hinds , a characteristic animal in the Cantabrian decorated caves, one horse , one reindeer (scarcely represented in the region of Cantabria), one aurochs and one animal difficult to identify. There are some signs, also. 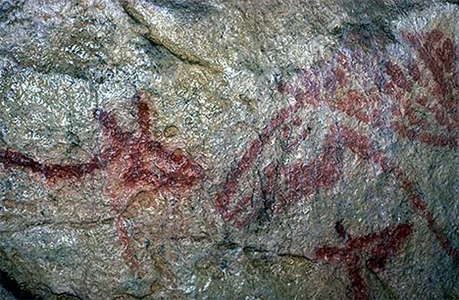 There are some black traces scattered all over the cave and some indecipherable remains of red paintings can be seen in the area at the far end. 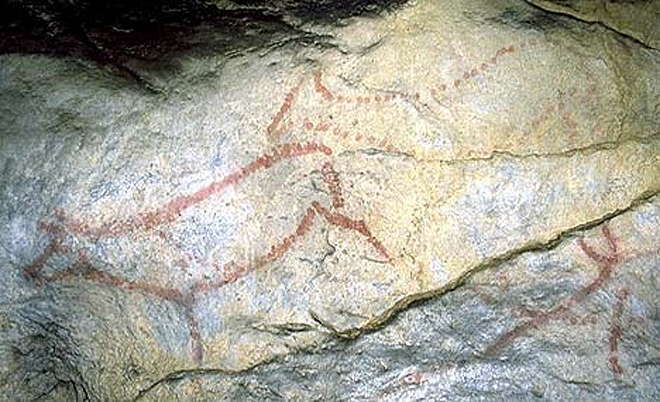 All the representations, except the black marks mentioned, were made with red paint, some of the figures including engraved lines. The technique employed for the representation of the figures is the inkpad, which consists of the contruction of lines by juxtaposition of dots. 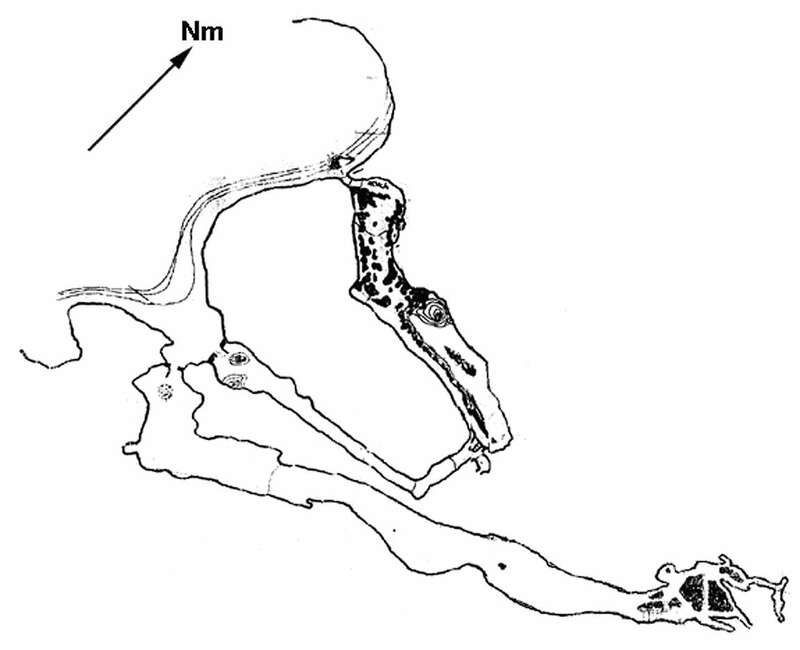 This type of technique appears in few places and always in a red colour in Arenaza cave (Galdames, Vizcaya), La Haza cave (Ramales), La Pasiga cave (Puente Viesgo) and Pondra (Ramales). 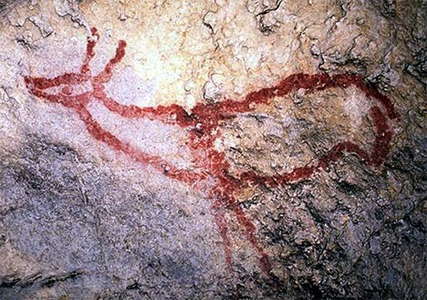 Given the limited use of this technique, some authors have thought of a possible "Escuela de Ramales" (School of Ramales), establishing chronologically this kind of painting between 20 000 and 14 400 years.